The Ring View displays a cluster as a ring of nodes from which you can determine at a glance node health, data distribution, and datacenter balance within a single visualization. To access the Ring view, click cluster > Nodes > Ring tab. 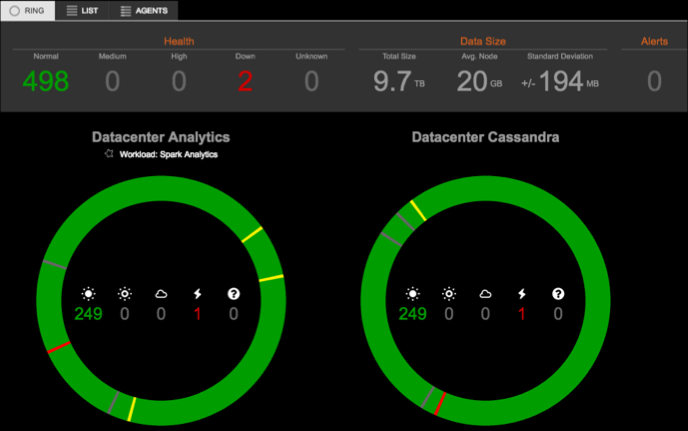 A health summary of each datacenter is centrally located within each ring. Each health icon corresponds to the overall health summary statistics from left to right: Normal, Medium, or High load; nodes that are down or have an unknown status. The size of each node represents its data size relative to all other nodes in the cluster. Nodes are positioned around the ring according to their assigned token. In the case of vnodes or ByteOrderedPartioner, nodes are displayed as slices of the ring and sized based on the percentage of data they own. If the datacenter has more nodes than can be displayed on the screen, the datacenter is represented as a condensed ring view, which typically occurs when the datacenter has hundreds of nodes. The Health summary pane located above the rings contains a cluster-wide summary of the data represented within the rings. 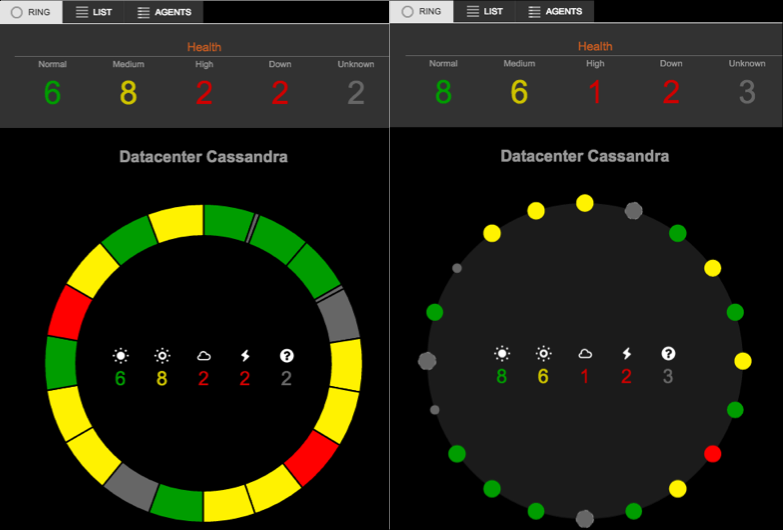 You can quickly get an idea of the health of your cluster without having to manually scan each ring, which is especially useful for larger clusters. Hovering over a number in the health summary highlights the nodes included in that total. Use the Health summary to easily identify potential problem nodes, as well as whether any multiple nodes within a single replica set are experiencing issues. The Data Size summary pane indicates the total size of the cluster data, the average size per node, and the standard deviation for data size between nodes. Alerts indicates the total number of any alerts that should be investigated. Clicking a total (normal, medium, and high load, or nodes that are down or status unknown) in the health summary, or on the totals within each ring presents a list of nodes included in the total. Hovering over a node or node slice displays some basic details within a ring about that node. The details are updated in real time. Clicking on a node in the nodes list reveals the node details dialog that displays more information. Use the Actions menu to run various operations on the node. Whenever any nodes in a datacenter are streaming data to or from another node within the cluster, a streaming icon (indicated by the arrows) is displayed inside of the ring. The appearance of the streaming icon distinguishes between streams contained within that datacenter ("intra-dc streams") and streams between datacenters ("inter-dc streams"). Clicking on the streams icon number in any datacenter opens the Active Streams window, which gives details on all of the active streams in the cluster. The goal of positioning non-virtual nodes in a ring is to visually represent whether a datacenter is balanced or not (that is, data is more likely to be evenly distributed across nodes). In a healthy ring, nodes are spread out evenly around the ring. If vnodes are enabled (the default), each node is made up of multiple virtual nodes (256 by default), so positioning by token would mean having hundreds of times as many nodes around the ring. If a partitioner that does not use consistent hashing is used, such as ByteOrderedPartitioner, data is not guaranteed to be distributed evenly, so positioning by token also has no guaranteed value. In those above cases, nodes are positioned based on the percentage of data they own in the ring, so a healthy ring is still represented by nodes being evenly spaced out. Rings are displayed by datacenter. This information is gathered from the agent that runs on each node. If a new datacenter has just been added, or if new nodes have been added to a cluster, the unknown datacenter list is temporarily displayed above all rings until OpsCenter fully processes the new cluster information.